When I saw these conchigliette (small shell shaped pasta I knew that a pea would sit beautifully in each one and so a pasta sauce was thought of before I finished shopping. Today is Tandy Tuesday and you can see Cindy’s contribution here. 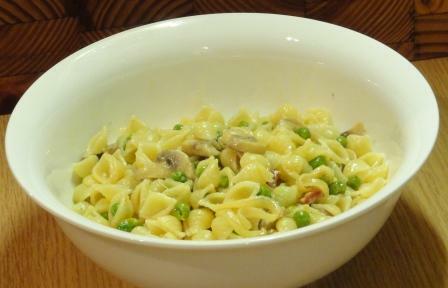 The main idea behind this concept is to make a pasta dish first and foremost. The second challenge is to use 5 ingredients. This is not always possible. Here I have made pea pasta.